Here are 10 stocks billionaires bought and 10 they sold during the fourth quarter of 2017. Many investors follow the moves of billionaires and hedge fund managers very closely, and why not? After all, these are people who have had tremendous success with their investments, so it would seem like a great place to look for ideas and general "smart money" trends. While it's never a good idea to buy or sell a stock just because a billionaire or hedge fund manager is, it's certainly a great way to find stocks to put on your radar. With that in mind, here are the 10 stocks billionaires and hedge fund managers bought the most of during the fourth quarter of 2017, and the 10 most-sold stocks by the same group in the same time frame, according to WalletHub's latest Hedge Fund Report -- along with some key trends. What are billionaires buying and selling now? Here are the 10 stocks billionaires and hedge fund managers bought the most of during the fourth quarter of 2017. Data Source: WalletHub Hedge Fund Report. That's the data, based on WalletHub's analysis of SEC filings from more than 400 of the largest U.S. hedge funds and billionaire investors. While there are tons of possible conclusions that could be drawn from this data, here are just a few key observations. Cashing out of FANG stocks? "FANG stocks" refers to four of the biggest names in tech -- Facebook, Amazon, Netflix, and Google (now Alphabet, but FANA simply doesn't sound as cool). Not only are the FANG stocks some of the most popular in the market, but they have also been some of the best performers. 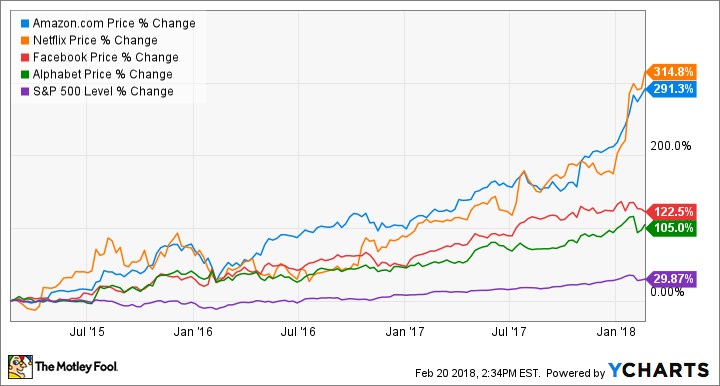 While the S&P 500 has increased by about 30% over the past three years, all of the FANG stocks have handily outperformed it. In fact, Netflix and Amazon have each increased by about 10 times as much as the S&P. It appears that hedge fund managers may be cashing in their gains. Three of the four FANG stocks (Amazon, Facebook, and Alphabet) are among the most-sold stocks, while none are among the most widely bought. Another thing to notice is that the stock moves of Warren Buffett-led Berkshire Hathaway (NYSE:BRK-A) (NYSE:BRK-B) are usually some of the biggest among all billionaires and hedge funds. Simply put, Berkshire's stock portfolio is massive, and it's not a stretch for Buffett and his team to invest (or dispose of) billions of dollars worth of a single stock. To illustrate this, consider that Berkshire's biggest stock buy for the quarter was Apple, and its biggest sale was IBM -- the overall number one stocks that billionaires bought and sold, respectively. Another interesting observation is that a couple of the most out-of-favor stocks in the market were on the buy list. Wells Fargo is one example. After a year plagued with scandals, Wells Fargo underperformed the banking sector by a wide margin, but hedge funds scooped up shares. General Electric is another example. GE has performed poorly in recent history, and there is speculation that the company could be broken up in 2018. Interestingly, both of these stocks experienced their worst declines after the start of 2018, so these were popular hedge fund stocks before their latest legs down. While it's still important to research and determine why hedge funds might have loaded up on these stocks, and if their reasons still apply, it's interesting to note that investors can now buy stock in either of these companies for less than billionaires were willing to pay. It's never a good idea to buy or sell a stock just because a billionaire did, and it's important for investors to do their own research to determine if a particular move is right for them. That said, this could be a great starting point for personal research. For example, I would have never thought that billionaires would want to own General Electric given the negative news surrounding the company, so I may take a closer look after learning this. Finally, each investor needs to make sure the stock they have their eye on fits their goals and risk tolerance, and that nothing significant has changed in the months since the hedge funds made their moves.